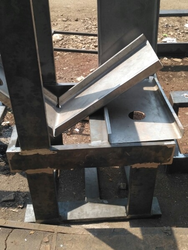 Manufacturer of hardened alloy steel dies. * Pressure Gauge calibrated in Tons & Kg/sq. cm. with Calibration & Traceability Certificate for customer's ISO requirements. Max. Capacity : 15 Tons. Max. Ram Stroke : 15 mm. Max. Working Pressure : 190 Kg/sq. cm. 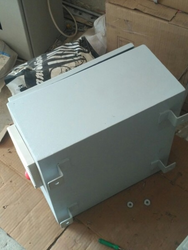 Usable Platen Size : 100 mm dia. Overall Dimensions : 300 L X 270 D X 425 H (mm). ¤ For 15 Tons Semi-Automatic Laboratory Press, please refer to Motorized Presses Section. Evacuable KBr Die Set is used to form pellets/circular discs for IR- FTIR Solid Sampling /Analytical Purpose. Most commonly used die is of 13 mm dia. pellet size. 13 mm KBr Die consists of a two-piece outer die, tungsten carbide mirror finished punches (anvils), pusher rod and pellet removal ring. Die is fitted with a nozzle for evacuation ( if required ). The die is manufactured from hardened stainless steel and can be easily dismantled for cleaning purposes . The entire set is enclosed in a velvetted teak-wood box , for safety and durability. (2) Tungsten Carbide is brittle in nature & is not guaranteed against breakage. (3) Spare punches, pushers are sold in pairs only. * Safety mechanisms to prevent excessive ram stroke & excessive pressure. Max. Working Pressure : 260 Kg/sq.cm. Usable Platen Size : 110 mm dia. Overall Dimensions : 350 L X 530 D X 630 H (mm). Overall Weight : 90 Kgs. For 25 Tons Semi-Automatic Lab. Press, please refer to Motorized Presses Section. Max. Working Pressure : 170 Kg/sq.cm. For 30 Tons Semi-Automatic Press, please refer to Motorized Presses Section. Max. Working Pressure : 160 Kg/sq.cm. Overall Dimensions : 900 L X 900 D X 1200 H (mm). Overall Weight : 250 Kgs. For 40 Tons Automatic Press, please refer to Motorised Presses Section. This Die Set was developed to overcome the limitations of using Aluminium cups. The problems of high long-run cost of Aluminium cups , disposal of cups & wastage of valuable sample powder pressed in the cups can be easily solved by using this die set. The Die Set is used for pressing powder samples in 40 mm re-usable steel rings. It consist of cylindrical punch, sleeve, springs, adapter, bottom plate & ring removal punch. The die set is made of hardened stainless steel and die parts have a close tolerance. The Die can be subjected to a Max. Load of 40 Tons. * Unique design of heating & cooling platens for positioning of heaters & for chilled water circulation. * High Quality Insulation Sheets for Heat Insulation. We regularly manufacture dies made from Hardened Alloy Steel for all Powder Compaction Applications. These Dies are used to form circular pellets for IR/ FTIR / XRF Solid Sampling. Hardened Alloy Steel Dies are preferred for all applications where use of tungsten carbide is not essential. Tungsten Carbide is not only a costly material but is also brittle in nature. Parts made from tungsten carbide have to be handled with extreme care. Dies made from Hardened Alloy Steel achieve a high hardness & hence take high pressure. Also, this material is corrosion resistant. Each die consists of two piece outer die body, punches (anvils), pusher rod & pellet removal ring. Die is fitted with a vacuum nozzle for evacuation (if requires). Both punches (anvils) have one face mirror finished, which ensures excellent surface finish of pellets. Die can be easily dismantled for cleaning purposes. The entire set is enclosed in a velvetted teakwood box for safety & durability. Dies are available in the sizes 6mm, 8mm, 10 mm, 13 mm, 15 mm, 20 mm, 25 mm, 30mm, 37mm, 40mm. The maximum load which each die can bear varies with reference to the internal diameter of each die. For certain specific applications, dies made from tungsten carbide are preferred over those made from hardened alloy steel. Tungsten carbide has very high compressive strength & hence can take high pressure. 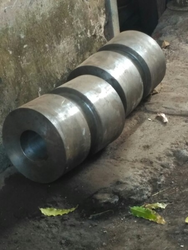 Each Die consists of outer die body, punches ( anvils), pusher rod & pellet removal ring. Carbide Punches (anvils) with mirror finished surface produce pellets (discs) with excellent surface finish. Most commonly used sizes are :- 10 mm, 13 mm, 20 mm & 25 mm. (2) Die Body with inner lining of carbide & outer casing of hardened steel. Punches & Pusher rod are made of hardened steel. (3) Die body of hardened steel. Punches & pusher rod are made of carbide. The dies can be subjected to a maximum load of 25 Tons, depending upon desired pellet diameter. Tungsten Carbide being brittle in nature, is not guaranteed against breakage. Hence, it should be handled with utmost care. Our equipments are also used in cosmetics industry, Lab. Cosmetic Powder Presses & Toolings are required for pressing of various cosmetic powders for Face Powder Compacts, Eye Shadow, Blush-on Etc. 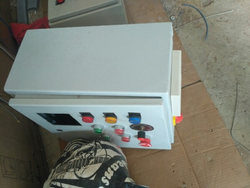 We mainly supply laboratory size manual machines for low cost production. 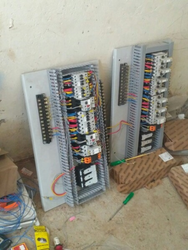 Pressure can be read on a mechanical gauge and pressure controller facility can also be provided if required. 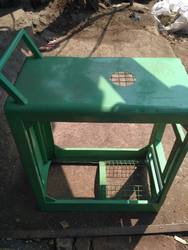 We also manufacture toolings for different sizes of godets and containers such as round, square, rectangular etc. 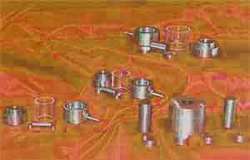 Different toolings can be used with the same Powder Press. Hydraulic tube pinching tool is used to separate linac tube from vacuum pumping system. Its function is to pinch copper tube of ¾ inch dia. & wall thickness of 2.5 mm. Hydraulic Pinching Tool comprises of hand pump, 3 meter long flexible hose pipe, pressure gauge & hydraulic cylinder with pinching jaws. Capacity of Hand Pump is 10,000 PSI. Pressure Gauge is provided to know at what pressure pinching is taking place. Jaws have proper rounding such that pinching results in vacuum tight joint after pinch off. Pinching takes place at the pressure of 8,000 PSI. Slit Flow Tester is used for studying the flow properties of free flowing powders such as pure terephthalic acid (PTA) powder. The sample is introduced into a hopper with a motorized door. This door rises allowing the powder to flow through it. The width of the slit when 100 gms. of powder has flowed through, is measured using a load cell. The experiment is repeated 20 times & average width is calculated. This average width determines the flow property of the sample powder. Study of flow properties of free flowing powders such as PTA is also carried out by means of Angle of Repose Apparatus. 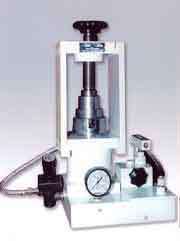 This apparatus is used for the purpose of determining the angle of repose of sample powder. A sample is poured through the apparatus in a controlled manner onto a vertical plate. The vertical height & horizontal distance of the resultant semi-cone of powder are used to calculate the angle of repose. This method is capable of measuring angles of repose from 31 degrees to 43 degrees. The latter corresponds to the worst flowing powder which will flow freely through the apparatus. This Die Set is used for pressing powder samples in 40 mm dia. Aluminium Cups. 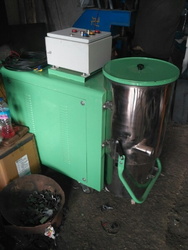 It consists of cylindrical punch, adapter, bottom plate & sample removal ring. All die parts are made of hardened & ground stainless steel. Cylindrical Punch has a smooth mirror-finished surface to obtain excellent sample quality. * Steady pressure building and controlled release ensures better pellet quality. * Settable parameters :- pressure, hold time & ram retracting time. * Transparent Polycarbonate safety guard has been provided in the area of operation. * Press is enclosed in a powder coated metallic cover, which is easily removable for maintenance purpose. Max. Working Pressure : 135 Kg/sq.cm. Platen Size : 110 mm dia. Overall dimensions : 400 L X 470 D X 560 H mm. Overall weight : 125 kgs. Max. Working Pressure : 165 Kg/sq.cm. Overall weight : 150 Kgs. Max. Working Pressure : 195 Kg/sq.cm. Max. Working Pressure : 200 Kg/sq.cm. Overall Weight : 200 Kgs. 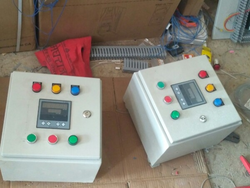 * Two anti-tie-down push buttons for operator safety. * Sensor to sense ram home position. 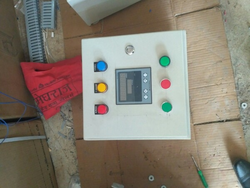 * Programmable parameters :- forward pressure, hold time, ram retracting time& ejection pressure. Max. Working Pressure : 300 Kg/sq.cm. Desired size of sample : 40 mm dia. Overall Weight : 300 Kgs. Round & square shaped dies are manufactured by us for moulding of polymers such as HDPE, LDPE, PP into thin films, sheets and round pellets. In case where a range of films/sheets having different thicknesses are to be obtained using the same die, we provide adequate spacers to achieve the end result. Samples are prepared by applying pressure & heat simultaneously. 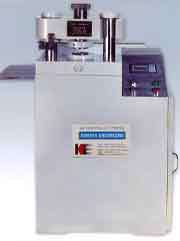 Break-point tester is used for checking the breaking-point pressure of ceramic components as well as those made from similar brittle materials. The Item which is to be tested for break-strength is placed in the cavity of die plate & hydraulic pressure is applied. The specially designed pressure indicator has 2 pointers, one of which shows the exact pressure applied on the ceramic balls at the time of breaking.